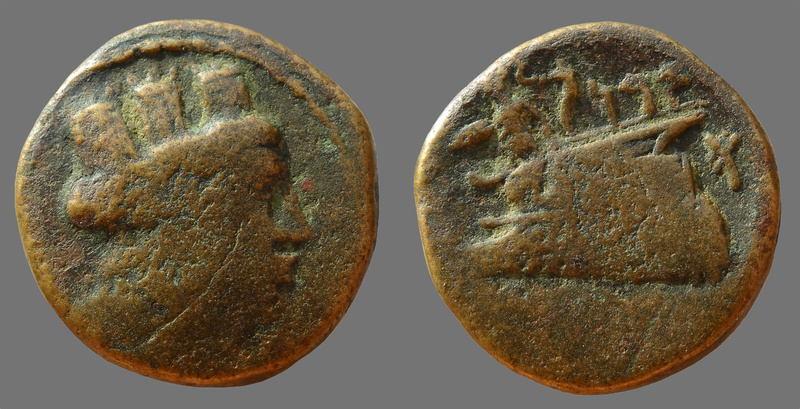 AE 18.86mm (Thickness 2.20mm), weight 4.59g, die axis = 12h (0 degrees), denomination C.
Obverse: Turreted head of Tyche right. Reverse: Prow of galley left with (Ἀθηνᾶ Πρόμαχος) Athena figurehead fighting left with shield and spear, cornucopia & Phoenician letters qoph (Q) resh (R) & nun (N) meaning Karne (Qurn in Phoenician) above, in right field Phoenician letter aleph (´). Aradian era date 37 below. Ref: Duyrat 2002 Pg.37 No.15-17; HGC10 Pg.51 No.178; BMC Phoenicia Pg.111 No.1 Pl.XIII 11.